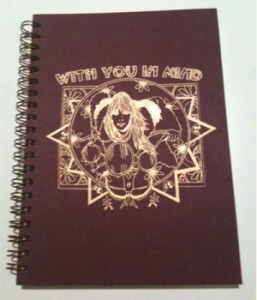 Heeb Note Jams, a collection of limited edition notebooks by Jess Rotter. Perfect for jotting down lyrics or writing down your last will and testament. Each of the 5″x7″, spiral-bound, hard cover journals consist of 50 sheets of lined paper with gold-colored wire binding complementing the foil imprinted designs. Heeb Note Jams are sold exclusively online in the Heeb shop for $10.00. Jess Rotter is best known as the mastermind of the whimsical musically influenced t-shirt line, Rotter and Friends. The tees’ prints are playful, heartfelt and inspired by rare music of the 1960s and 7’s. Rotter’s artwork exhibits internationally in Tokyo, Marfa, London, New York City, and Los Angeles. Her 4-piece capsule collection for Project Red was released globally in The Gap, and the label Rotter and Friends was responsible for hosting the first NYC live performance from Boston psyche legend Bobb Trimble. In addition to all the fun, she’s also at the helm of PR for Mexican Summer/Kemado Records and enjoys huge mugs of coffee.